Membership Fees, including OFAH memberships are due by March 31, 2019. Membership Fees received between April 1st and June 30th are subject to an additional $20.00 late fee. Membership Fees received after June 30th are to be accompanied with a new membership application, membership dues for that year and a $30.00 administration fee. **New members please note there is a one-time membership profile set up fee of $30.00 to be included with the membership application and annual fee. Please contact us by email for an application form. Awarded @ AGM to a member with the largest caught fish of the year, either kept, or for catch and release. 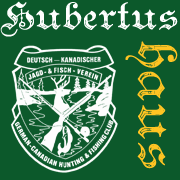 Started in 1965 and is awarded at the Jägerball to a male member going above and beyond a member’s duty in a sportsmanlike manner as discussed by the Board of Directors by a point system. This ‘Raccoon Hat’ modelled after those worn by the early Canadian Pioneers, can only be won once. Awarded @ the AGM to a member with the best score from the High-Power Shoot. Started in 1996 and is awarded at the Jägerball to a female member going above and beyond a member’s duty as discussed by the Board of Directors by a point system. This Gold Pendant can only be won once.